When it comes to making money online FAR too many people are struggling to do well. While there are many reasons for this, one of the main reasons is that they are promoting the wrong products. What do I mean by the "wrong" products? Products with poor marketing funnels. Products that do not match the audience to which they advertise. There could be other factors of course, but these are the main ones I see. I firmly believe in only promoting the best products. And although I know that great marketing can sell any product I know that the lifetime value of a customer far outweighs any big commissions from promoting junk. Over my 15 or so years (as of this writing) I have developed a template, a matrix if you will, for choosing profitable products. In that time I've been the top affiliate for several big-name marketers, won computers, iPads and even a Rolex watch. I say this not to brag (not my style) but rather to say that this Matrix works. And I'm going to reveal it to you right now, in this article. First, let's get visual and see what this template looks like graphically. Here is how I drew it out using the wonderful LucidChart. Please notice the intersection of the three circles. That is the sweet spot. It is where you want to get and want to stay. That's because the middle represents passive profits. In other words, making money while you sleep. And yes ... this CAN happen for you. If it can happen for anyone, it can happen for you. So let's briefly define what the three circles mean. Core products are products people need to succeed online. They are basic, usually evergreen and often come with a monthly recurring fee. Private Label Rights (PLR) Products. Promoting core products is smart because everyone needs them. Especially "newbies". Think back to when you first came online. You quickly learned that you needed an autoresponder and ad tracking and web hosting and much more. Even with "billions" of people already online, the "newbie" market it huge and very hot. One key to succeeding online is to promote high quality core products. Including a healthy mix of core products in your marketing funnel is smart because you develop a happy customer. They need what you offer. They like what they buy. When you recommend another product, they listen. Now let's look at Feeder Products. I call them "feeder" because they feed naturally into the next sale. Beth buys an autoresponder service based on your recommendation. She is excited to build her list and set up her automation. But she's not really sure what to do next. And she doesn't really know what she will say to her new subscribers. You can help her, and yourself, by recommending a copywriter or a pre-written email follow up series. Or you might recommend a traffic source. Or a really cool course on list building. All using your affiliate link of course. And all sources you know and trust. Choosing feeder products is pretty easy. Just think about what a person would need based on buying the core product you are promoting. Once you think of that, search for the best of the best products you can offer that compliment the core product you offer. Want Your Own Product TODAY? Today products are hot today and sometimes gone tomorrow. They are often sold with healthy doses of scarcity (the cart is closing!) and they can generate super-high commissions. One mistake I see people make is focusing too much on promoting "hot" products. Because everything that goes up will come down. Just like the real world. Not trying to be negative. I've just seen it happen too many times. If it were not bad form, I could name literally dozens of white-hot products that were going to "take over the world" and are no longer in business. Many of them fall under their own weight, having created so many buyers that they could not support them. Some were closed by the government for being outright scams. Please understand me - I am 100% on board with supporting high-quality product launches and other short-term marketing events. No problem there. But if you focus on only that you will totally burn out your list or burn out your budget trying to compete with the many other affiliates trying to earn the money and win the inevitable prizes. So there you have it, three categories of products you can promote. The nice thing here is that these product categories support each other when you set your funnel up correctly. And - this is my favorite part - you can totally automate this marketing plan using nothing more than a smart autoresponder, a blog, and a great squeeze page! And you know how I feel about automation ... it is a beautiful thing indeed!? Great advice, Charlie. I love your emphasis on creating passive income. It’s wonderful! On about the 23rd of every month, passive income “magically” appears in my bank account. And it’s been about 10 years since I’ve done any work whatsoever for those deposits. Active income trades freedom for cash. Passive income doesn’t require the trade-off, once it’s set up. Yes, you have to work to set it all in motion. I call that priming the pump. But if you’re going to work for income, let’s work to prime the pump for passive income. 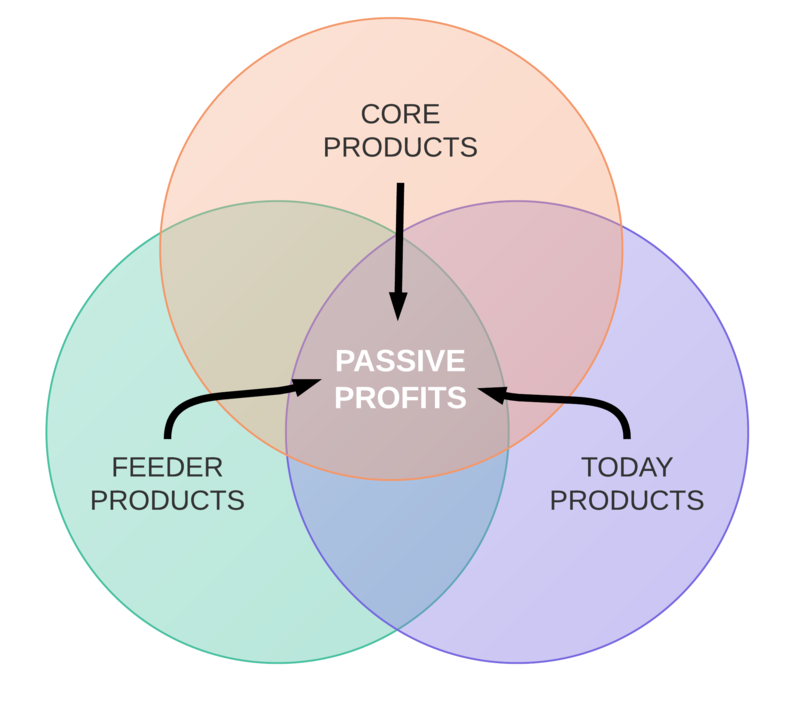 I also love your distinction between Core, Feeder, and Today’s products. They’re all an important part of a very well thought out business model…one destined for success. Thanks Mark. Always great to hear from you!